The Kansas City Royals just won the World Series but the team’s first baseman, Eric Hosmer, is winning at life. The clutch hitter is dating uber-hottie Kacie McDonnell. The name might ring a bell as McDonnell is an up and coming sideline reporter. She also dated former Minnesota Vikings quarterback Christian Ponder and was once engaged to former Kansas City Chiefs quarterback Aaron Murray. 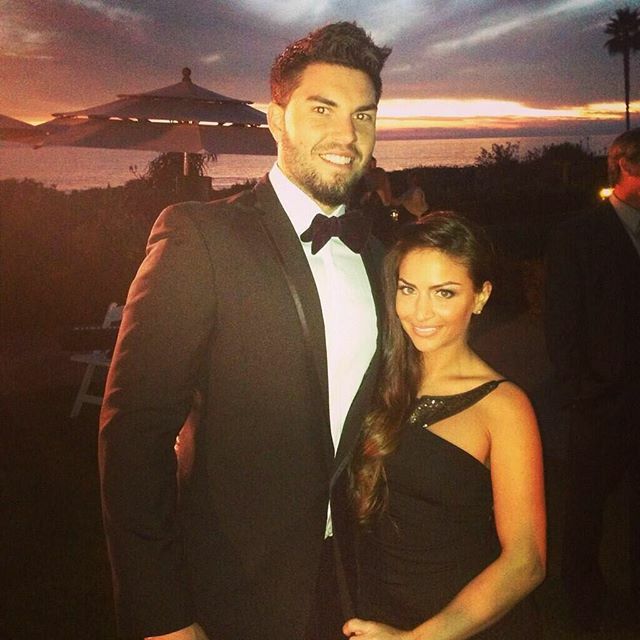 McDonnell broke the news about her relationship with Hosmer in a recent Instagram post. Hosmer, a two-time Gold Glove winner, is fresh off of leading the Royals to the team’s first World Series title in three decades. Baseball insiders far and wide expect Hosmer, 25, to cash in on a very lucrative contract extension within the next couple of years. He likely first spotted McDonnell on TV as she kickstarted her career in the City of Fountains as a reporter and anchor for the local NBC affiliate, NBC 41. Prior to her move to Kansas City, she worked as a traffic reporter on Philadelphia Fox 29’s Good Day Philadelphia. McDonnell first spilled over into the mainstream in 2011 when she dated Florida State quarterback Christian Ponder. Her next hunk, Aaron Murray, eventually moved on to marry ESPN reporter Samantha Steele. Numerous gossip magazines and websites have also linked McDonnell to Philadelphia Phillies pitcher Jonathan Pettibone. While McDonnell has had her share of high profile flings in the past, no one can fault Hosmer for hooking up with the vixen. She has gorgeous, silky long black hair, striking eyes, a lovely bronze skin tone and a perfect hourglass figure. Yet McDonnell isn’t a brainless bimbo in the slightest. She graduated from Villanova University in 2012 with a degree in Communications. She began working on television at a local station in Philadelphia within a few months of earning her undergraduate degree. She also worked as a personality on Fox Morning News as well. Before attending Villanova, McDonnell won the Miss Teen Pennsylvania International competition. The Pottsville, Pennsylvania native is drop dead gorgeous and looks fantastic on Hosmer’s side. Hosmer was drafted by the Kansas City Royals with the third overall pick of the 2008 Major League Baseball Draft. He was called up to the big leagues in May of 2011 after tearing up the minor leagues with Royals’ affiliates the Burlington Bees and the Wilmington Blue Rocks. He hit .293 and smacked 19 home runs in only 128 games in his first year, propelling him to a third place finish in Rookie of the Year balloting. Hosmer has not been linked to any famous starlets until he and McDonnell both posted pictures to their Instagram accounts to break the news to the public. Their posts were undoubtedly a coordinated effort to inform Kansas City Royals fans about the budding relationship. Also a Pennsylvania native, Hosmer has slugged a total of 77 home runs, 779 hits and 368 runs batted across his five seasons in Major League Baseball. This past season was Hosmer’s best. He batted .297 with 18 long balls and 93 runs batted in. He is also responsible for recording the final putout to clinch both the AL Central division crown as well as the American League Championship. His 2015 postseason success is best summed up with the following statistic: Hosmer surpassed all-time Royals great, George Brett, with the most runs batted in the team’s postseason history.